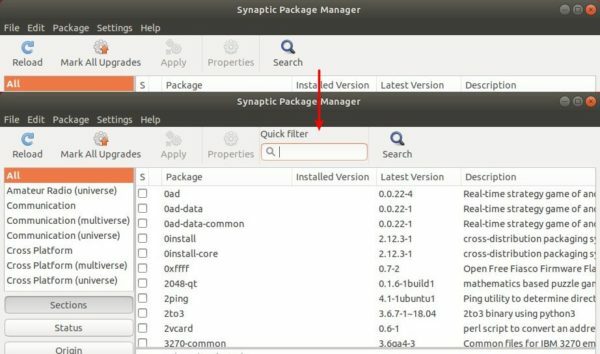 For those prefer installing and removing Ubuntu packages via Synaptic package manager, you must have noticed the ‘Quick filter’ search function has been replaced by a search button. This quick tutorial is going to show you how to re-enable the ‘Quick filter’ function in Synaptic package manager in Ubuntu 18.04, Ubuntu 16.04, and higher. The search box is offered by ‘apt-xapian-index’, which is a ‘recommends’ dependency package for Synaptic. Finally open or re-open Synaptic package manager, and you’ll see the search box back. Unfortunately for perfectionist, the previous ‘Search’ button seems not easy to be removed from tool-bar. I really miss quick search. I’m not sure, just try it out as Debian and Ubuntu packages are building almost with same rules, though there may be differences on patches and dependency packages versions. Thanks Ji, It worked flawlessly.